Fish That Grow Twice as Fast, Not Just a Story - JP loves LIFE! I saw something on twitter Sunday thanks to a couple of meatheads (@itweetmeat and @steakperfection) that has stuck with me for a little while now. The tweet I’m talking about pointed out the New York Times article Genetically Altered Salmon Set to Move Closer to Your Table – NYTimes.com. Maybe it resonated so much because I watched as my friend Lem ate an incredibly yummy looking bagel and lox today (I highly recommend The Beauty Shop in Cooper-Young if you’re looking for Sunday brunch in Memphis). And maybe it just stuck because I absolutely love salmon – smoked, grilled, sushi, whatever! The article made me think about a few things as I read it (and well into the hours that follow). The idea that someone can take one gene out of something and place it into something else to get a desired result still blows me away despite the fact I actually know people who have developed this concept and put it into use effectively to better agriculture. Science and scientists amaze me. I’ve frequently heard people debate wild vs farm-raised and I don’t get it. 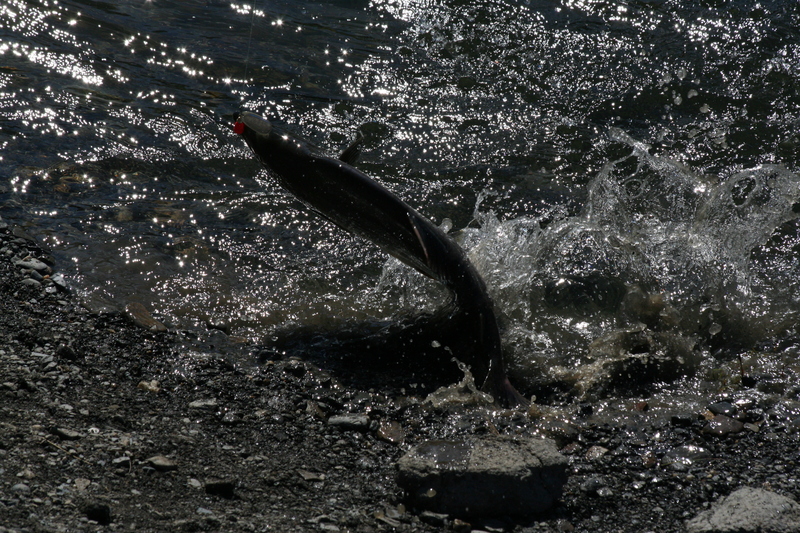 I LOVED being in Alaska during the salmon run in 2008. My niece was working at a resort restaurant and I couldn’t get enough of the bagel & lox! I loved the salmon there — had it every day at least once I think. And I’m willing to assume it was mostly wild caught rather than farm-raised but I enjoy both. I want salmon that is prepared fresh and tastes yummy. Having lived in an area where aquaculture is a major contributor to the dinner table (and was a contributor to the economy), I have a great deal of comfort with the way farmers raised fish. I like the idea that they could produce more fish — I think a lot of us should be eating more fish anyway and the ability to produce it easier could provide more on the market. My brother-in-law, and consequently our whole family, loves to fish and this discovery seems to parallel the speed at which fish grow in our tales. Okay, maybe our fish grow faster, especially since we usually catch and release. What do you think of this new biotech salmon idea? What do you think about aquaculture & fishing? 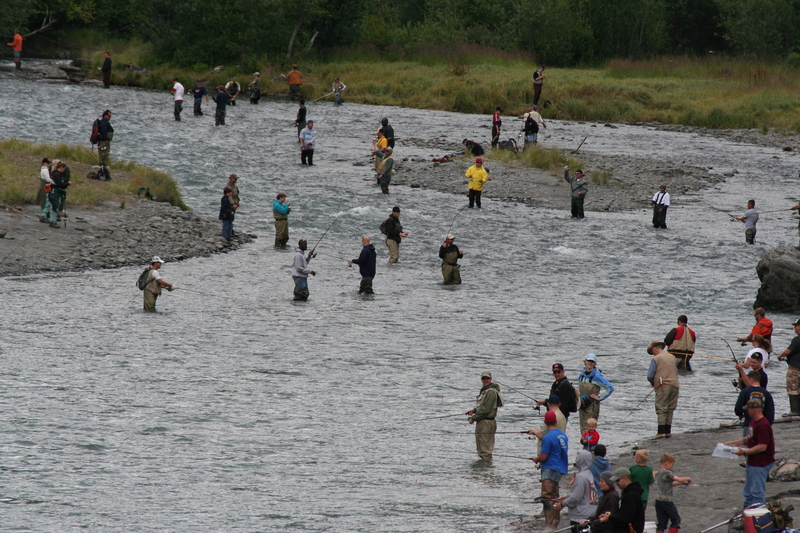 Amazing how many people want to catch their own salmon during the late summer run in Alaska. I loved the trip and all the time spent along lakes, rivers, etc, but I’m fine with letting someone else fight that crowd to get me salmon! I really don’t have a problem with genetically altered salmon. I would like to try some sometime. BUT I do wonder if the genetically altered, farm raised salmon will taste just as good as salmon harvested from the wild. I give you the example of shrimp. To me freshwater/farm raised shrimp just does not taste as good. In fact there is a different texture to freshwater shrimp that I don’t like. I suppose that the next argument could be, is fish from the ocean/river better for a person (health-wise) than genetically altered, farm raised? I’ll let somebody else argue that point. Interesting story, Janice. I would like to try some genetically altered, farm raised salmon sometime. I would also like to fish for genetically altered salmon in a pond/body of water where they raise them. That’s a cool concept. Not very sporting, but cool just the same. I love salmon too (maybe too much) but I only eat wild caught salmon. Years ago a read that farm raised salmon was not naturallu pink and was hence injected with red dyes. I also read that farm raised salmon is more prone to parasites. Who knows. I’ll probably lose my hair due to mercury poisoning 😉 I don’t know about genetically altered salmon though. I think I saw this on a SyFy movie…it ended badly.